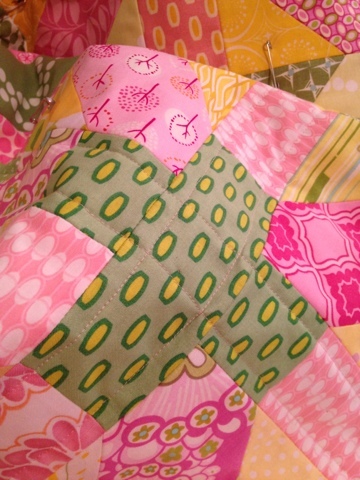 I started quilting my xplusalong the other day. It's definitely the biggest quilt I've ever machine quilted. I've done other big ones either by hand quilting or tying. I'm doing a pretty simple straight line grid with the walking foot on this one, because I figured that would be the easiest based on its size. I'm using a really pretty pale pink Aurifil 50wt. Yeah. Manhandling that beast through my machine was a lot harder than I expected! And I have a large harp machine! Part of my problem is that my set up isn't ideal. My table is relatively small, and I don't have a drop-in table. 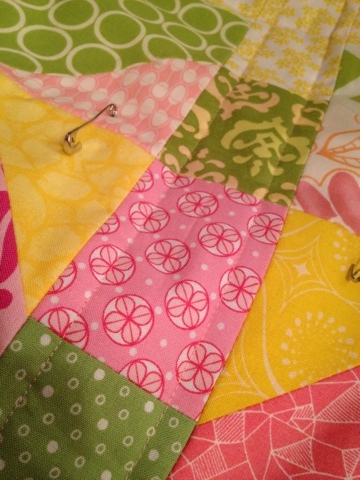 The quilt kept catching on the edges of my extension table. I improvised with some tv tables to catch the edges of the quilt, and at one point I was using (clean!) rubbery gardening gloves to get a better grip. The process was getting smoother the more lines I did, but it's still going to take a lot of trial and error. Looking good! I was having the same issue last night. I felt like every time I stopped, the needle shifted to the side when I started again because gravity was pulling the quilt down. Frustrating! I was having that problem when I first started, but once I put the TV trays by the table, it got much better! 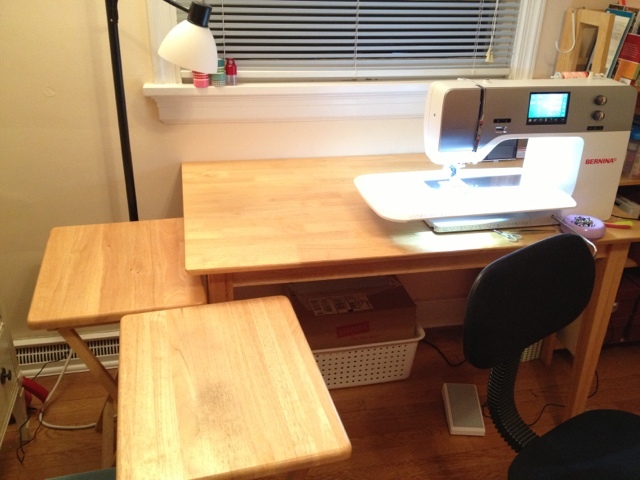 I feel your pain - my table is just as small and it makes a big job like quilting that much harder! But it looks fantastic so far - can't wait to see the finished quilt! I consider quilting on my small machine part of my weekly workout. The effort it takes to keep everything balanced and moving through the machines has to be great for the arm muscles! It will be worth it in the end as the snippets I have seen of the quilt looks wonderful. Thanks! Yeah, my arms were definitely a little sore the next day! After I started FMQing smaller quilts, I made a bigger one and thought it would be easier to straight line quilt the big one...but I had to send the darn thing thru the machine so many times it was even WORSE....what's your take on this now that you've done both? I have a small 7inch harp. You have a pretty good size quilting room. Have you considered getting a full sheet of plywood, cutting a spot out for your machine to sit flush, propping that baby up on some legs (2X4's)? I did this and then rounded the 4 corners and SHELLACKED the piss out of it (better than poly) and WOW! A 4X8 table for about $40 and a fee hours of time. Alternately, you could also cover the table with thick plastic, but it looks bad (works good though). Shellac can be recoated about every 30 minutes as it dries super fast due to the denatured alcohol...also, have you ever tried turning your machine so the motor is away from you and needle is facing you? It's awesome for FMQ, especially if you have a flat surface! I think that straight line quilting is more difficult and cumbersome on a home machine, but its still quicker than fmq. I'm hoping to have the xplusalong finished in just a few sessions, but you can see that I'm still working in my grandfathers quilt, even though its smaller. When I am piecing, I just tape a little piece of thin card stock over the crack between the machine and the "table". It's a HUGE space to work on. I keep my cutting set up all the time on one end unless I am quilting. I built my table pretty tall because I stand to quilt and piece so everything is just the right height for me. You can actually use OSB for the wood but you'll need extra extra coats of shellac to smoothe out the chips. OSB is considerable cheaper. Bingo! I have the exact same problem (see my recent blog post for pictures). SO frustrating when the quilt gets caught on the edge of the extension table. Unfortunately, my machine is sitting on a cheapo Ikea table; I doubt I can have it modified to drop in the machine. I am looking at surrounding the machine with a foam board contraption I saw on the web for when I am quilting the big project. Trial and error!